Registration for all of our products is handled at the time of your products activation. Listed below are some brief instructions for how to register & activate a product. If you are having difficulties registering and activating a specific product please visit our Customer Service Support page for more help. 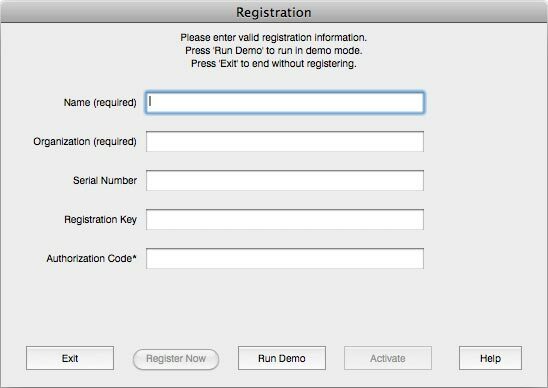 During the first launch of the product you will be presented with a registration dialogue box like the one represented below. You must fill in your Name and Organization. If you don't have an organization or do not wish to enter one you can enter a blank space or write "home" in this field. The serial Number will be automatically generated for you. At this time please leave the Authorization Code Field blank and Click Register. Do not close this window for now as we will come back to it at the end of these instructions. Upon Clicking on register you will be brought to a web page for product Registration. The top half of the form should be filled in automatically for you based on what you entered into the registration dialogue in step 5. Please verify this information and fill out the remaining information requested. Once everything has been filled out click on the button for Submit Registration. You will then see a new webpage thanking you for your registration and delivering you your Authorization code. An email will also be sent to you with your Authorization Code inside. Please keep this code in a safe place as you will need it to authorize your product. Copy and Paste your Authorization code from the email or webpage into the Authorization Code field in the dialogue box from step 5. This completes the registration process. If you have any difficulties with a specific product activation or registration please our Customer Service Support page for more help.